Jackson Paller speaks at the Student Action NU meeting Thursday evening. At the meeting, a representative from Reclaim Evanston advocated for local political activism. Political organization Student Action NU held a meeting Thursday in Annenberg Hall to encourage students to be active in local politics and elections. 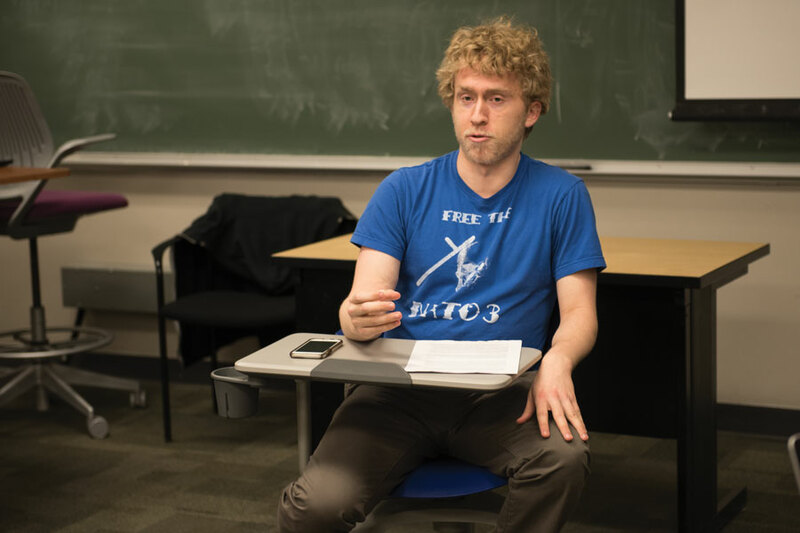 Weinberg senior Jackson Paller, a member of the group, began the meeting by emphasizing the need to hold Democratic politicians accountable in resisting President Donald Trump’s policies. Though Paller said he did support Hillary Clinton in the 2016 presidential election, he believes both she and other mainstream Democratic politicians did not present a vision that appealed enough to voters. Especially during the Trump administration, it is important that Democrats take a less centrist stance and move more strongly to the left, he said. Cindy Bush, a representative from Reclaim Evanston — an organization that endorses and canvases for local candidates — also spoke at the meeting in an effort to promote political activism and participation in the upcoming city elections. Reclaim Evanston has thus far endorsed four Evanston candidates: Robin Rue Simmons for 5th Ward alderman, Alex Block for the 3rd Ward, Rob Bady for the 8th Ward and Devon Reid for city clerk. Bush said Reclaim Evanston has been endorsing candidates in aldermanic races, rather than mayoral ones, because the organization has a greater chance of making a difference in those races. She said, however, that Reclaim Evanston may make an endorsement of a mayoral candidate after the primaries if two candidates proceed to the April 4 general election. Although he had urged students to be take a stronger stance for what they believe in, Paller ended on an optimistic note. Local activism, he said, is a good place to start making political change. “As much as this seems like a dark place right now, this is kind of the beginning of getting out of that and creating a much better country than when Donald Trump got elected in the first place,” Paller said. Ben Powell, a member of Student Action NU, said he thought the meeting effectively engaged the NU community in the importance of local elections. “We always want to make each meeting better than the last,” the SESP sophomore told The Daily.